Two prize winners proudly showing off their winnings. Park, Banks DIH. The stall was manned by Archery Guyana members: Nicholas Hing, Umasankar Madray, Jessica Callender and Shereeda Yusuf. Special thanks also to Eric Hing for assisting with the archery stall. The Fair was well attended by many patrons but there was particular emphasis on the archery game where throngs of supporters flocked to take chances at hitting “gold” (the most central ring of the target)! The archery game attracted persons from all age groups and the fun was shared with every arrow being shot. Participants enjoyed the shooting much more than winning a prize due to the cheering that they received from bystanders and enthusiastic newcomers awaiting their turns. The attraction of the game was traditional barebow shooting at the two targets – one for adults and one for children – placed at varying distances with the end goal to hit the yellow centre ring. One shot to gold secured a win. As such, aspiring archers for the afternoon were given 3 or 6 arrows to shoot in an effort to win one of the many prizes displayed. 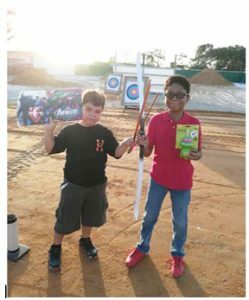 There were excited faces and loud cheering and awe displayed by spectators as the target was hit especially by the youngest patrons. 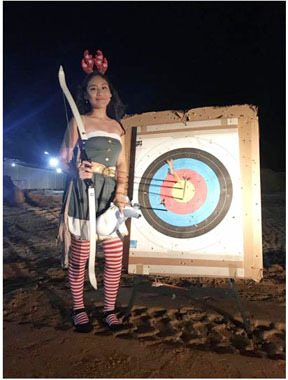 One of Santa’s elves decided to try her hand at archery. Although, Archery Guyana’s stall consistently attracted a large cross section of the patrons, it unfortunately had to close even as more persons gathered to shoot because the fair had officially ended. Archery Guyana is pleased to once again partner for this event to bring Christmas Cheer to all. Thanks to St. Joseph’s Mercy Hospital, Mr. Chris Fernandes and Mr. Steven Fernandes. More information on Archery Guyana can be found on www.ArcheryGuyana.org.